The Area - The Eastern Pyrenees, Pyrenees-Orientales, within the Languedoc-Roussillon region of France. This area, with its warm sunny microclimate, enjoys some of the mildest weather in France, making it ideal for holidays throughout the year. 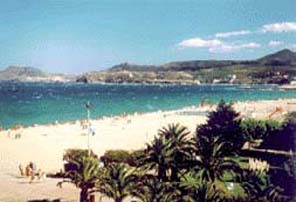 There is a sizeable fresh water beach with lake swimming at Vinca, some 15-20 minutes drive from Vernet. Natural rock pools in the Rotja river near Sahorre (known locally as Sahorre beach), provide another scenic bathing area and you can swim by the waterfalls - Cascades des Anglais (these are significantly cooler! ), just above Vernet. There are several thermal spas in the area, of which a particular favourite is the open air, naturally warm, St. Thomas Les Bains. Also there is a Water Theme Park at Err which opens during the summer months. The glorious sandy beaches of the Mediterranean are less than an hour away by car - St.Cyprien and Argeles and a little further along the coast, the picturesque port towns of Collioure and Banyuls.. The picturesque port town of Collioure (below). or lake swimming at Vinca (above). 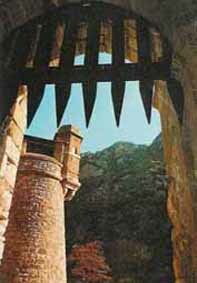 The picturesque medieval walled settlement of Villefranche de Conflent is just 5 mins drive away. 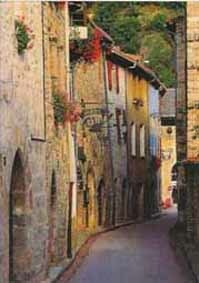 Within the fortified walls, you will find narrow streets containing a variety of shops, cafes and restaurants. 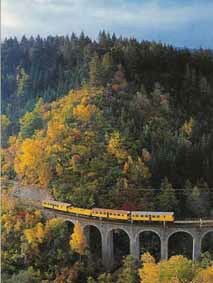 Le Petit Train Jaune (Little Yellow Train), one of Europe's most scenic railways starts it's journey from here. With open carriages in the summer months, you can really appreciate the stunning scenery. Perched on a hillside above Villefranche is the 17th century Fort Liberia built by Vauban in 1681 and reinforced during the time of Napoleon III. inside Villefranche (left) and one of the gates (right). Perched on a steep slope to the north, Fort Liberia looks down upon the town. An underground staircase, with 734 steps, connects the fort to the town below. Walk along the defensive walls of the fort. Admire the picturesque scenery of the Pyrénées as the train winds it's way over lofty viaducts and through deep gorges. 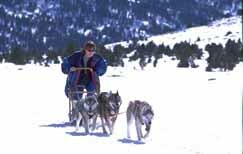 The full journey passes through the ski resorts, ending some 63km later, in Latour de Carol. 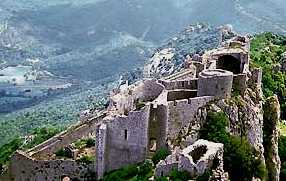 The Cathar Castles of Peyrepertuse (right) and Queribus are less than an hour away. The spectacular views are well worth the climb, which can be quite exhilarating on a windy day! Also just outside the town are the Prehistoric Grotte Grandes Canalettes (underground caves), which have spectacular illuminated rock formations. During July and August there are the ‘son et lumiere’ shows. 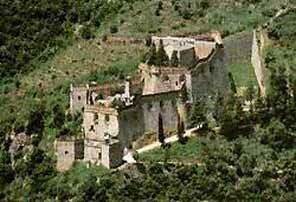 The abbey of Saint-Martin-du-Canigou is situated some 3 km south of Vernet. Built in the 11th century on a narrow rocky outcrop at a height of 1055 metres. Located deep in the forest, its setting and stunning Romanesque architecture inspire in its visitors a great sense of tranquillity and reflection. It is particularly atmospheric when viewed from above through low cloud. Visitors can reach the abbey on foot from Casteil, after a climb lasting about 45 minutes. Or travel there by 4X4 vehicle (book in Vernet). 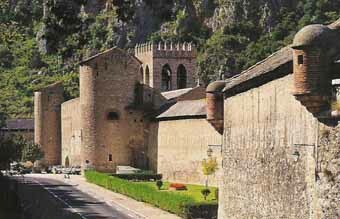 The abbey of Saint-Michel-de-Cuixa is another magnificent Romanesque building. Situated at the foot of the Canigou mountain, it is one of the most outstanding and important of all the Catalan historic monuments. You will discover here a remarkable ensemble of architectural treasures: a huge pre-Romanesque church dating from the tenth century, a bell-tower of Lombardy design, a crypt of remarkable proportions dating from the eleventh century, and the remains of a Romanesque cloister which is the largest in the Pyrenees and which was the first to be constructed in the Catalan territories. Casteil's animal park. A small but delightful zoological garden is to be found close to the village of Casteil, which is located 2 km up the Cady valley from Vernet. Established by a local family, the park is home to lions, bears, monkeys, a llama, deer, and several species of bird. Prades (some 9 kms away) is best known for its annual music festival, the Pablo Casals Festival. Held in July, this festival attracts musicians from around the world. Prades has an attractive tree (and cafe / restaurant!) lined square. Carcassonne, with it's mediaeval walled city is some 32 km further north from Rennes. Take a guided tour around a selection of Roussillon Vineyards. Relax and enjoy the wine tasting whilst someone else does the driving. The French Tour Co. run tours for individuals or small groups. With about 250 kms of marked footpaths and stunning scenery, this is one of the best walking areas in Europe. From the village, a 10 minute walk to Belvedere provides spectacular views, an hour and a half from the village you have the waterfalls, Cascades des Anglais, a 3-hour walk and you can visit the famous monastery St. Martin du Canigou (also reachable by car and 45 minutes walk), and the long trek to the summit of the Canigou (2785 metres/about 9,000 ft). There are several routes to the summit (some more demanding than others - allow 8 - 10 hours depending on route and experience). Alternatively you can reach the chalet at Cortalets (2150 metres altitude) by jeep and walk the last two hours to the top. We have the guide: "Pyrenees Orientales Circuits Pedestres" by Alain Borg which contains details of local walks together with maps (available for your use, in the apartment). The village shop contains many more excellent guides and maps for the serious mountain walker. From the tourist office Vernet Les Bains you can obtain an illustrated guide to 13 way-marked circular walks. Visit our blog vernetlesbains.tumblr.com also www.balades-pyrenees.com to gain a flavour of what the Pyrenees has to offer. The village contains a good range of shops: grocery, newsagents, patisseries, vintners, hairdressers, electrical and banks. There are several cafes and restaurants to suite all tastes and pockets. Many of the shops and cafes surround a central area which hosts a lively market three mornings a week. On the outskirts is an Intermarche supermarket. Prades (some 9 kms away), has more extensive shopping, a market on Tuesday and a large Super-U supermarket. For duty-free shopping, Andorra is an easy day excursion.